What is a Sister City? 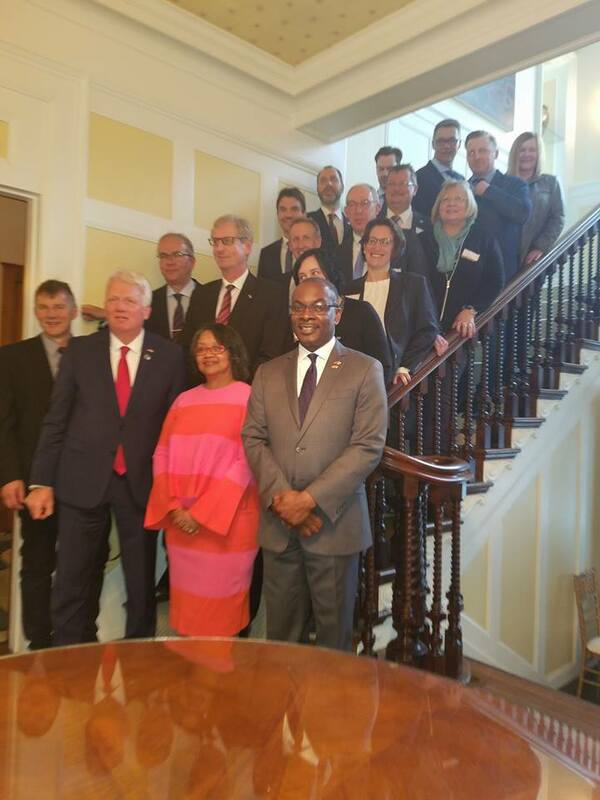 The Oberbürgermeister der Stadt (or Lord Mayor) of Dortmund, Germany, will lead a delegation of 20 government, education, and business leaders to Buffalo, New York, to help celebrate the two sister cities’ 40th anniversary next month. The delegates will attend the ground breaking ceremony on April 15 for a future park on the shore of Lake Erie, to be named Dortmund Park as a testament to the two cities’ historic partnership. Lord Mayor Ullrich Sierau and the others will then spend the rest of the day meeting with their American counterparts and building upon their existing partnership by exploring new investment and exchange opportunities. 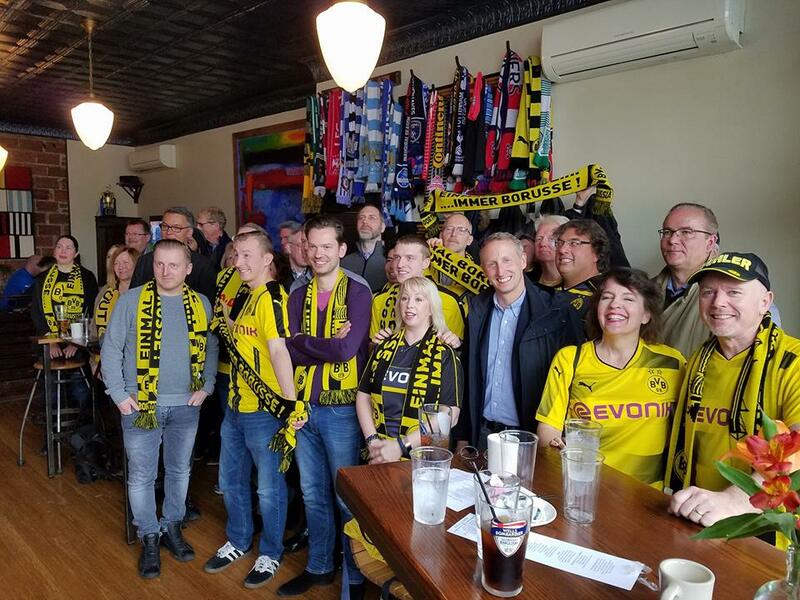 The partnership between Buffalo and Dortmund (as it exists now) focuses primarily on student exchanges, including a mutual exchange program that sends American students to Dortmund and German students to Buffalo on alternating summers. The weekend before the delegation arrives from Germany, the Buffalo-Dortmund Sister City Committee is also sponsoring a new fundraiser called ‘Halfway to Oktoberfest,’ with all proceeds going toward its student exchange programs. 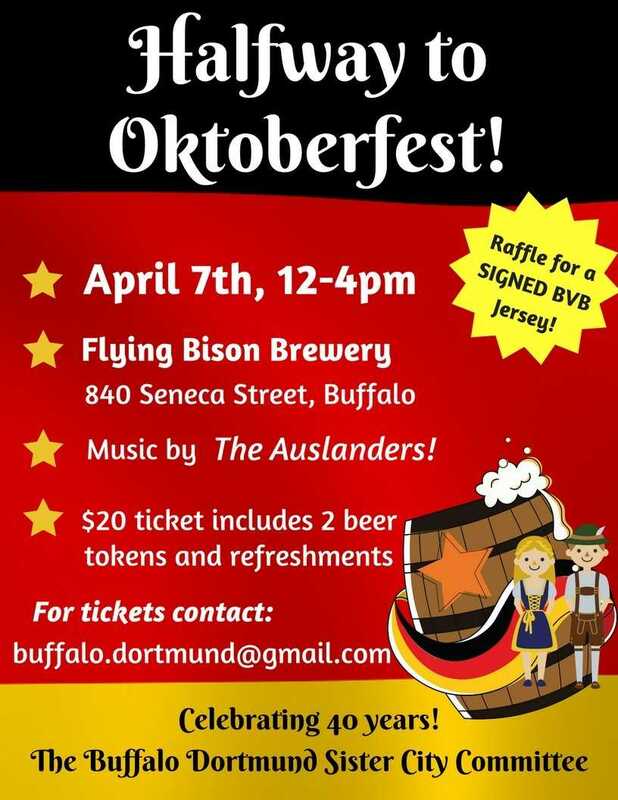 Folks in Buffalo are invited to Flying Bison Brewery on April 7 for a night of live music, raffles, and the unveiling of a new Dortmund-style lager. Dan Scanlon from the Auslandsgesellschaft NRW e.V. 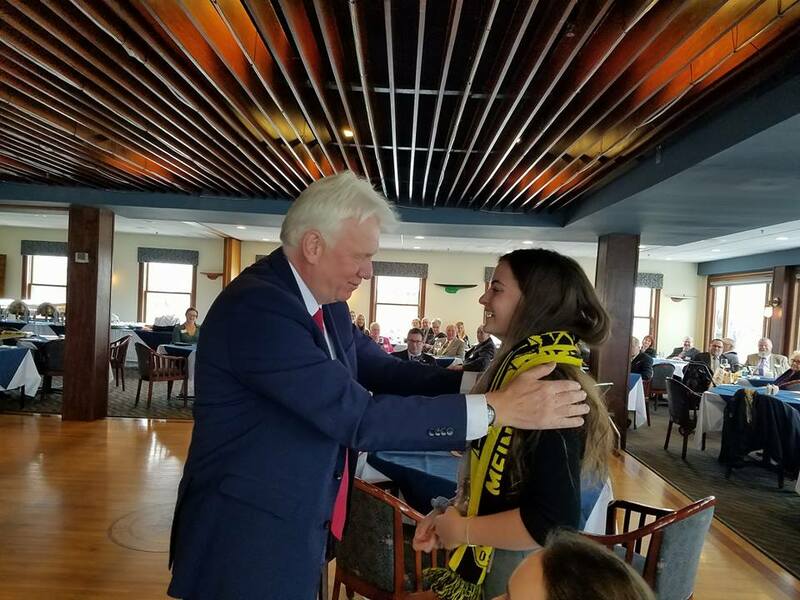 and Lynn Engle Program Director of the Buffalo Dortmund Buffalo-Dortmund Sister City Student Exchange Programs greeted by Oberbürgermeister der Stadt Dortmund at the annual New Year’s reception in the Dortmund January 2018. The thriving beer industry was one of the many similarities Herbert Morgenroth noted between Buffalo and his native Dortmund when he arrived in the United States in 1972 as part of a teacher exchange program with the University of Buffalo, and organized by the Carl Duisberg Society. He was also struck by the similarity in size, and the centrality of steel production in both cities. Dortmund is situated in the heart of the industrialized Ruhr Valley, in what was then West Germany. Morgenroth decided the two cities should become partners, and was instrumental in the eventual signing of a sister city accord. Forty years later, citizen diplomats and folks from all corners of these two cities are still working hard to strengthen the partnership. 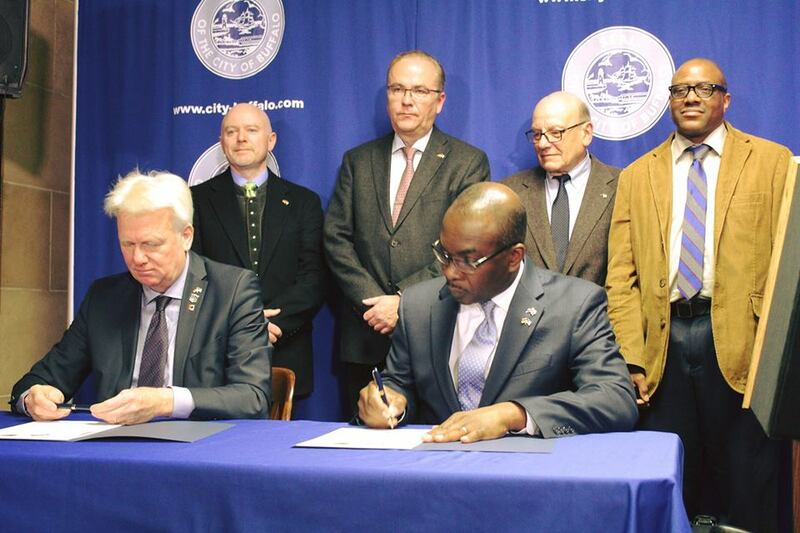 To help focus these efforts, Buffalo’s mayor Byron Brown sent a formal invitation to the Oberbürgermeister der Stadt in November. This will be the first time in two decades that a delegation of this kind has visited Buffalo from its German sister city. The Lord Mayor’s delegation flies into Buffalo on Saturday, April 14. That evening, they head downtown for an opening reception at a hotel on the bank of the Buffalo River canal, followed by a tour of the waterfront. 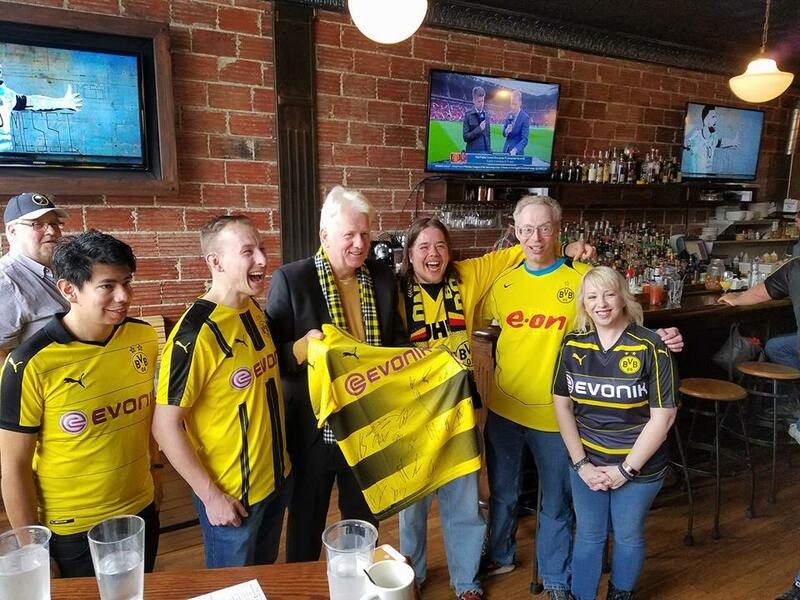 The following morning, they will watch a live soccer match between the famed Borussia Dortmund team and their cross-town rivals FC Schalke 04 at a local sports bar. After that, the delegates will make their way over to the corner of Busti Ave. and Niagara St. for the dedication ceremony, followed by an afternoon luncheon at the Buffalo Yacht Club. There, Mayor Brown and Lord Mayor Sierau will deliver some remarks, as will Matthew Collard, Honorary Consul for Germany in Buffalo; Greg Engle, President of the Buffalo-Dortmund Sister City Committee; Lynn Engle, Director of the Buffalo Dortmund Exchange Program; and Joe Roetter, head of the Federation of German-American Societies. 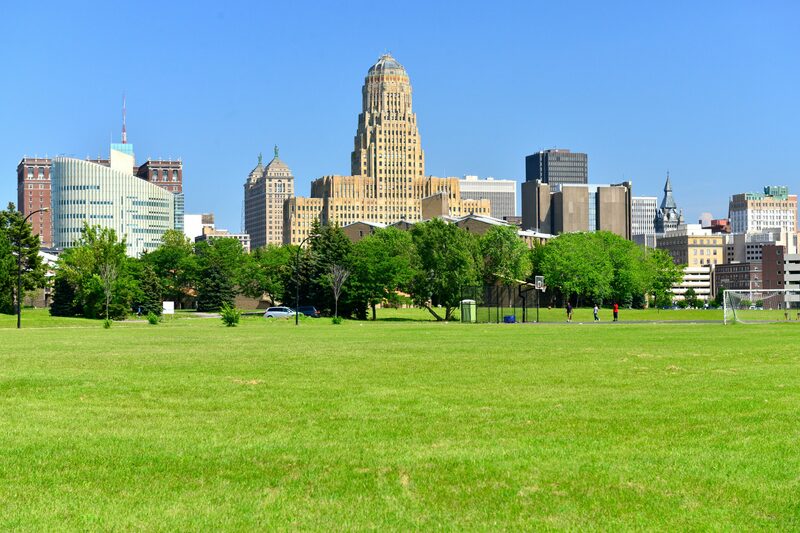 Then, folks from Buffalo State College and the University of Buffalo will meet with delegates, including the chancellor and two department chairs from the Technical University of Dortmund, to explore student and teacher exchange opportunities. The delegation will also tour the newly-opened Oishei Children’s Hospital of Buffalo and Jacobs School of Medicine and Biomedical Sciences. 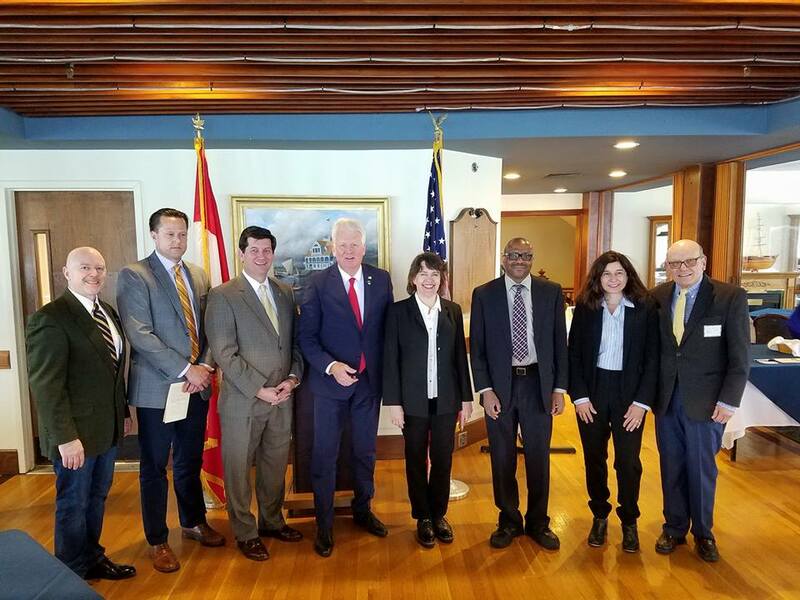 Meanwhile, the investment arm of the delegation will be meeting with the Erie Canal Harbor Development Corporation, a division of the Empire State Development group, to talk about the urban renaissance of Buffalo. This summer, a group of students will also make the trip from Buffalo to Dortmund, this time as part of an annual exchange program between the two cities. From July 16 to August 4, the students will experience the culture of the Ruhr Valley while staying with German host families. 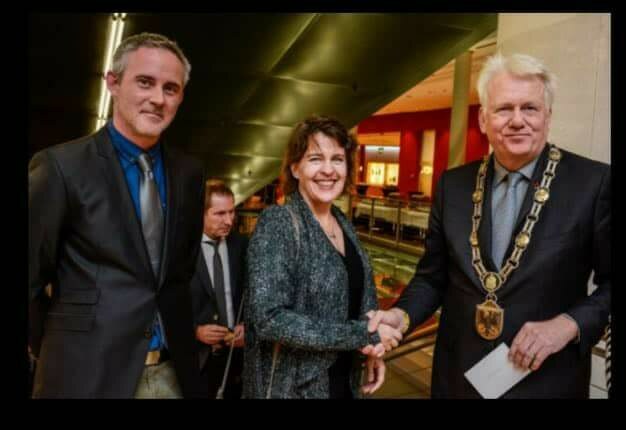 They will also help celebrate the sister cities’ 4 0th anniversary, attending a welcome reception at the Auslandsgesellschaft NRW e.V (a German intercultural exchange group), and travelling to Amsterdam and Berlin. In August, Buffalo returns the favor by giving Dortmund students a chance to attend high school in New York for a semester. The director of the exchange program, Lynn Engle, also recently developed a January-term intensive German language exchange with the help of a lecturer at Buffalo State College. 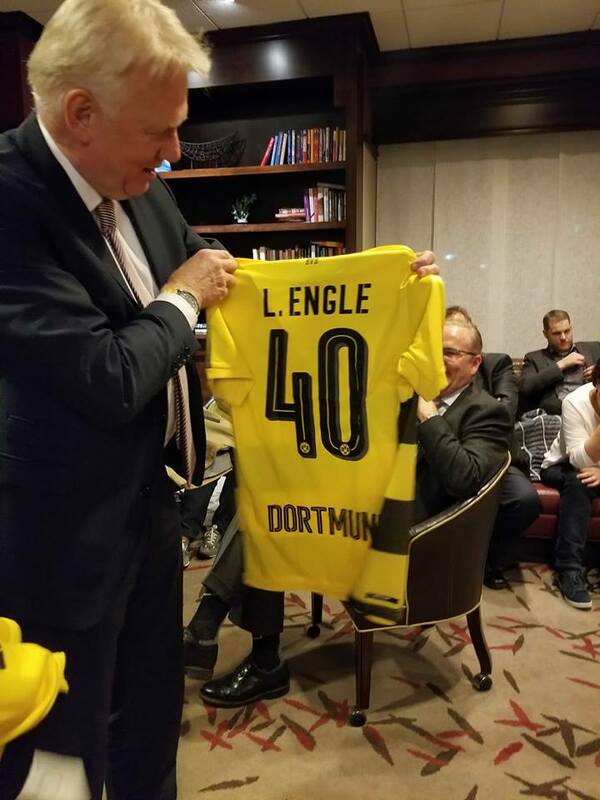 Engle traveled to Dortmund this past January to kick off the new program. ‘Halfway to Oktoberfest’ is another new offering by the committee. Slated for National Beer Day (April 7), this event will feature the unveiling of a new ‘altbier’ (German for ‘old beer,’ after its older method for fermentation) by Flying Bison Brewery owner Tim Herzog. Dortmund’s soccer team—Borussia Dortmund—has donated a signed jersey from 2018 to raffle off at the event. All proceeds will help fund the committee’s student exchanges, as well as the Burt Nelson Essay Contest, a German-language essay contest for schools in Western New York that offer the language. No Replies to "Dortmund Comes to Buffalo in April for 40th Anniversary Tour"